The Redwood Valley boys basketball team finished their season at 16-13 after losses in the Class AA State Tournament to Perham by a score of 73-58 in the Class AA State Quarterfinals at Williams Arena and to Esko by a score of 66-56 in the Class AA State Consolation Semifinals at Concordia University in St. Paul. Congratulations to Redwood Valley on an incredible season! The Redwood Valley Cardinals battled Perham tough in the first half, opening an early lead at 8-1 before Perham tied the score and reclaimed the lead. 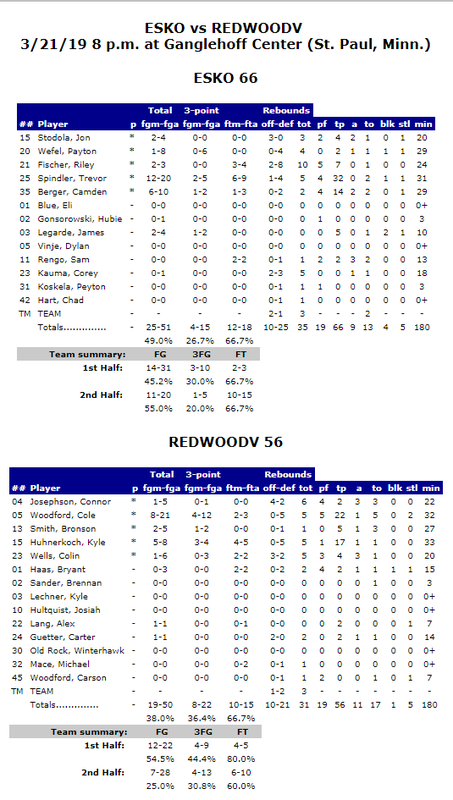 Redwood Valley was able to battle back to get within 4 at the half at 28-24. 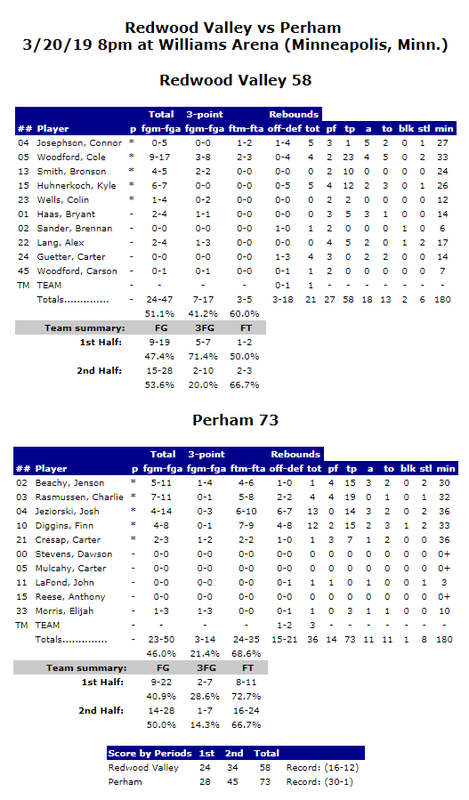 Perham opened the second half on a 14-4 run to take control of the game for good. Redwood Valley got as close as 10 at 45-35 but Perham was able to push back out to a 15 point advantage in the win. The Redwood County American Dairy Association Player of the Game was Cole Woodford, who scored 23 points in the loss. Points in the paint-REDWOODV 30,PERHAM 40. Points off turnovers-REDWOODV 9,PERHAM 18. 2nd chance points-REDWOODV 3,PERHAM 15. Fast break points-REDWOODV 4,PERHAM 13. Bench points-REDWOODV 10,PERHAM 3. Score tied-3 times. Lead changed-1 time. Last FG-REDWOODV 2nd-00:37, PERHAM 2nd-00:50. Largest lead-REDWOODV by 7 1st-14:08, PERHAM by 17 2nd-03:37. The Cardinals had a physical battle against Esko, with the Cardinals again getting off to a hot start before Esko rallied to tie the score. Both teams traded baskets throughout the half before Esko hit a layup with time winding down to take a 33-32 lead at the half. Despite being called for 9 fouls halfway through the second half Esko was able to keep calm and weather a few Cardinal runs and hang on for the win. The Redwood County American Dairy Association Player of the Game was Cole Woodford, who scored 22 points in his final game as a Cardinal.